Set in 1954, US marshal Teddy Daniels and his new partner Chuck Alue are headed to Shutter Island, insane asylum and home of America’s most dangerous and mentally disturbed criminals. The two marshals have been called to the island after the escape of a patient, Rachel Solando, who had been convicted of murdering her three children by drowning them in the lake behind her house. There seems to be no way that the woman could have escaped since not one person had noticed her leave her cell and even if she had escaped she had apparently done it without even wearing shoes. No one believes that she has left the island considering the only way on and off the island is a ferry that only travels back and forth to the mainland twice a day. Teddy discovers a clue however when he finds a note hidden in Rachel’s cell stating ‘the rule of 4’ and ‘who is 67’. As the investigation continues the two marshals gradually notice just how strange everyone on the island is acting, right down to the guards and even the doctors themselves. It’s obvious the inmates have been coached as to what to say since every one of them keeps saying the same thing as each other. All that is except for one female inmate who scrawls a cryptic message in Teddy’s notebook, ‘run’. 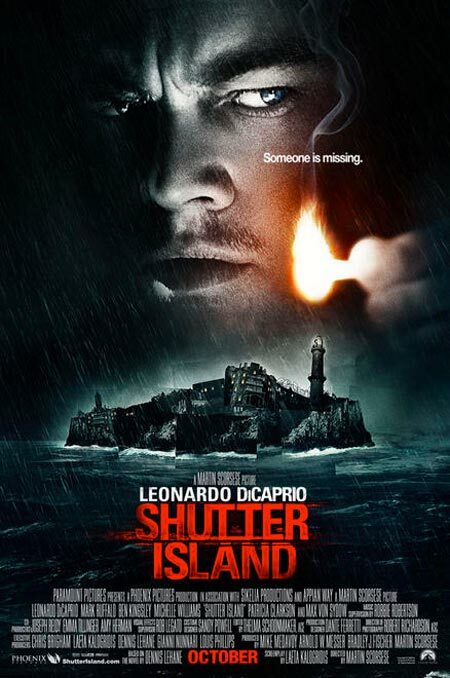 Teddy begins to grow suspicious and suspects a cover up, at the very least there is a secret being hidden on Shutter Island and Teddy thinks he knows exactly what that is. Teddy believes that the inmates on Shutter Island are being used as lab rats in experiments involving mind control. Using a tip from a Shutter Island survivor, Teddy is determined to prove that not everything is as it appears to be and that those running the asylum are even more dangerous than those imprisoned inside. Teddy better watch his back though because it looks like the doctors are on to him and will do anything to cover their tracks, even going as far as trying to make Teddy believe he’s insane. Shutter Island is an alright movie, I did enjoy it. There really is only one problem, I had it pretty much figured out in about an hour. You see, the premise of Shutter Island isn’t exactly new. In fact if you happen to be a geek (like me) you have probably already seen this exact same scenario on such shows as Star Trek: The Next Generation, Frame of Mind (where aliens try to convince Riker he’s an asylum inmate and not commander of the USS Enterprise) or Buffy the Vampire Slayer, Normal Again (where The Trio use demon venom to try to convince Buffy she is a patient in an asylum and not a vampire slayer) or Smallville, Labyrinth (where an escapee from the Phantom Zone tries to convince Clark he’s a patient in an asylum and not an alien from Krypton) or Charmed, Brain Drain (where The Source kidnaps Piper and tries to convince her she is an inmate at an asylum and not a witch)… I think you get the idea. In fact the only real twist in Shutter Island is that Teddy Daniels actually is a patient in an asylum and not a US marshal, well at least not since he killed his wife for murdering their three children. Turns out Teddy is actually Andrew Laeddis, the man who he had blamed for killing his wife in a fire. The grief of losing his children combined with the guilt of killing his wife caused Andrew to break with reality and everyone on Shutter Island was involved in an elaborate role play in hopes of playing out his delusion and bringing him back to reality. I guess you could say the real plot twist in Shutter Island is that there isn’t actually any conspiracy at all. As I said, Shutter Island is a good movie, the acting is great and there are a couple of nice cameos by the likes of Jackie Earle Haley and Elias Koteas but if you’ve ever encountered one of these plot devices in the past you’re not going to have a hard time figuring it out here. Shutter Island is directed by Martin Scorsese and stars Leonardo DiCaprio, Mark Ruffalo, Ben Kingsley, Michelle Williams, Emily Mortimer, Max von Sydow, Jackie Earle Haley, Ted Levine, John Carroll Lynch, Elias Koteas and Patricia Clarkson. Shutter Island is slated for DVD and Blue-ray release on June 8th 2010.